Since the beginning of the human species, we have been at the whim of Mother Nature. Her awesome power can destroy vast areas and cause chaos for the inhabitants. 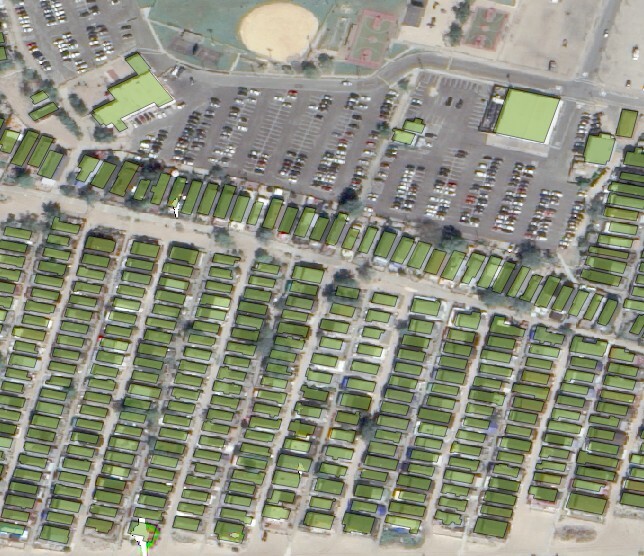 The use of satellite data to monitor the Earths surface is becoming more and more essential. 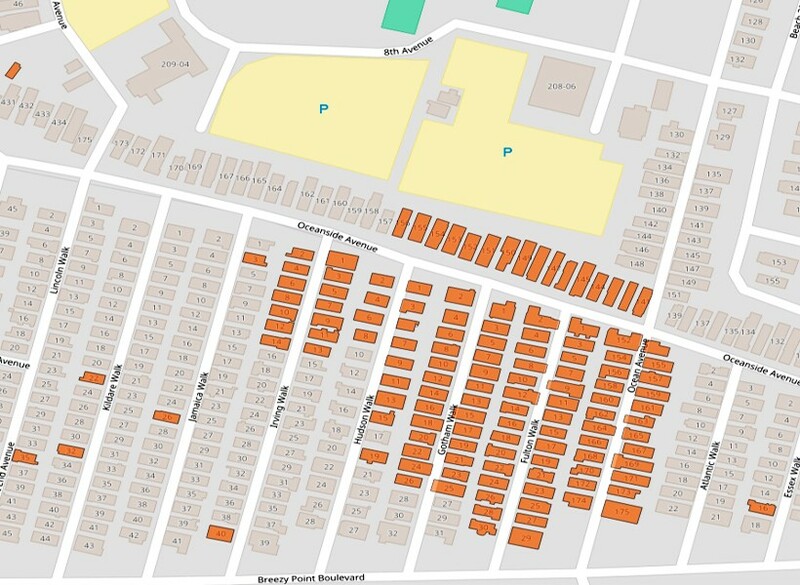 Of particular importance are the disasters and hurricane monitoring systems that can help people to identify damage in remote areas, measure the consequences of the events, and estimate the overall damage to a given area. From a computing perspective, such an important task needs to be implemented to assist in various situations. 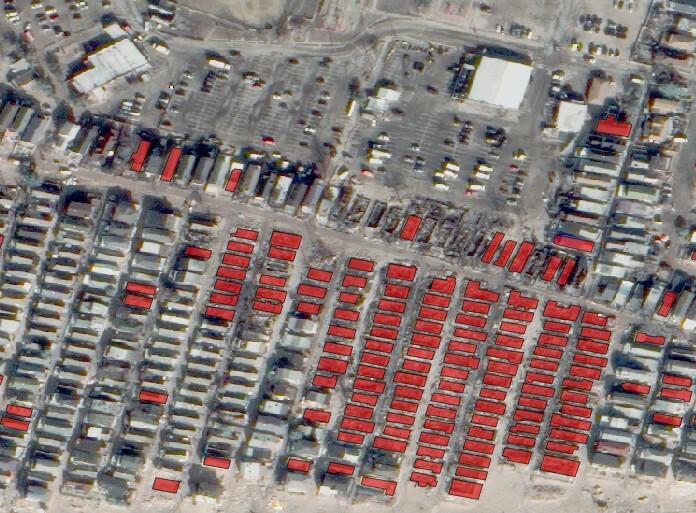 To analyze and estimate the effects of a disaster, we use high-resolution, satellite imagery from an area of interest. 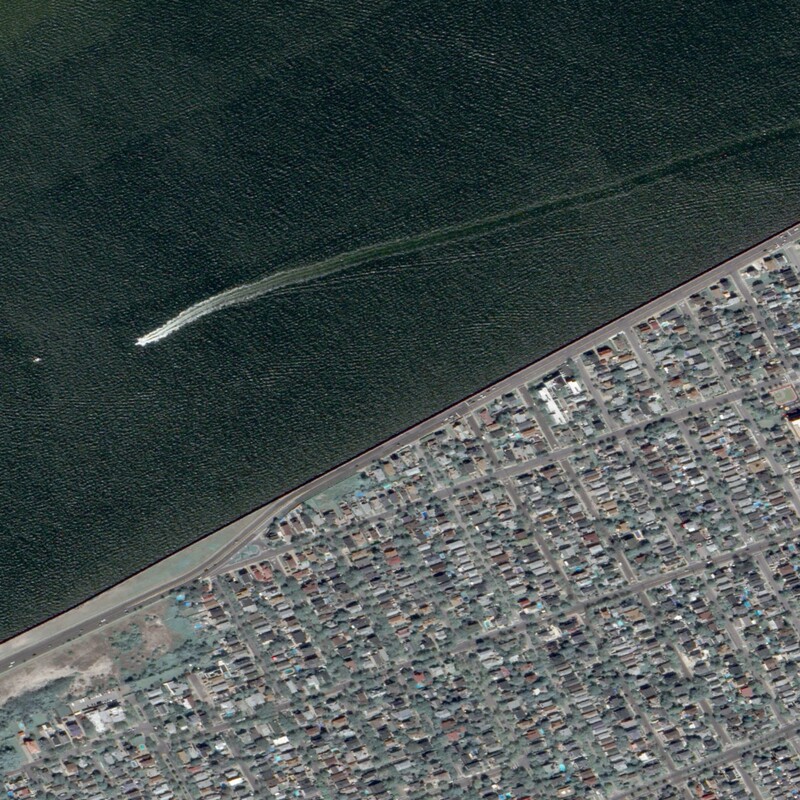 This can be obtained from Google Earth. 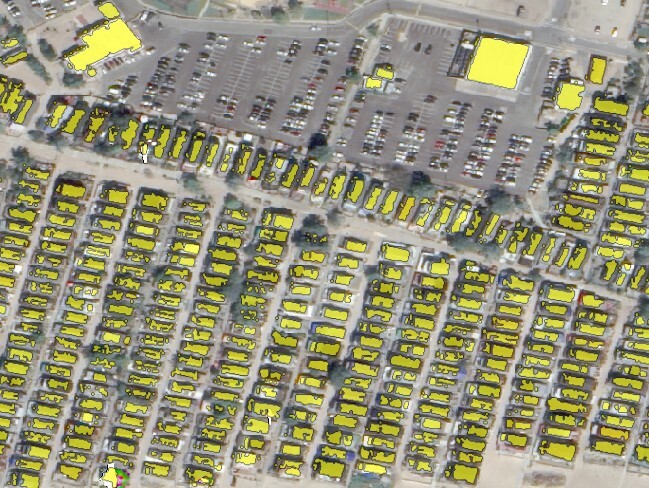 We can also get free OSM vector data that has a detailed ground truth mask of houses. 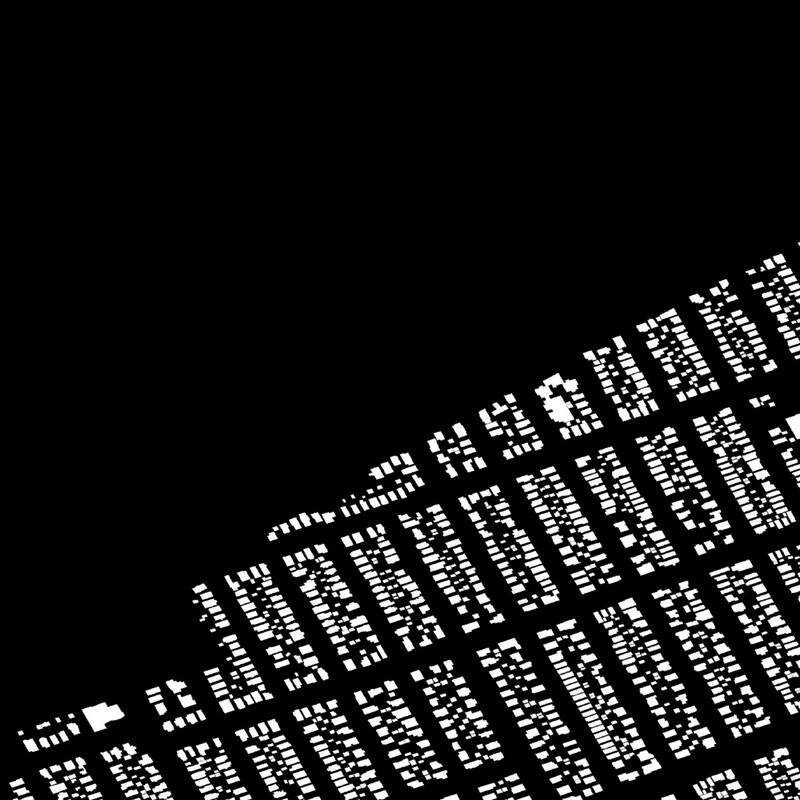 This is the latest vector zip from New York (Figure 1). Next, we rasterize (convert from vector to raster) the image using a tool from gdal, called gdal_rasterize. 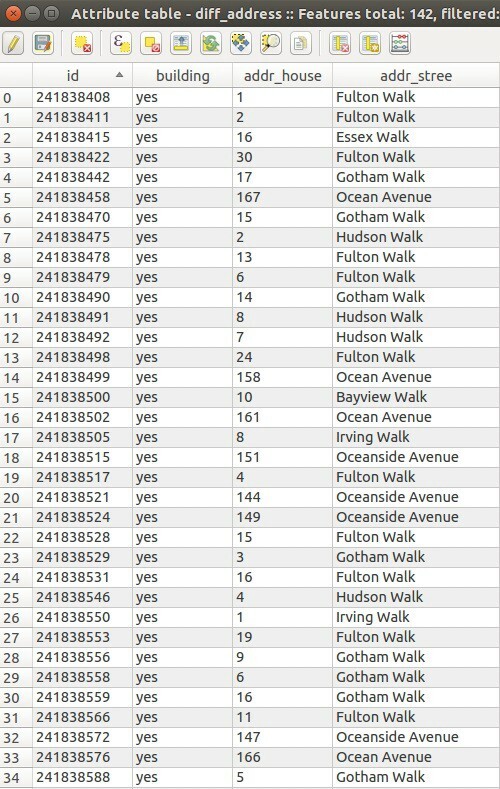 As a result we have acquired a training and testing dataset from Long Island (Figure 2). 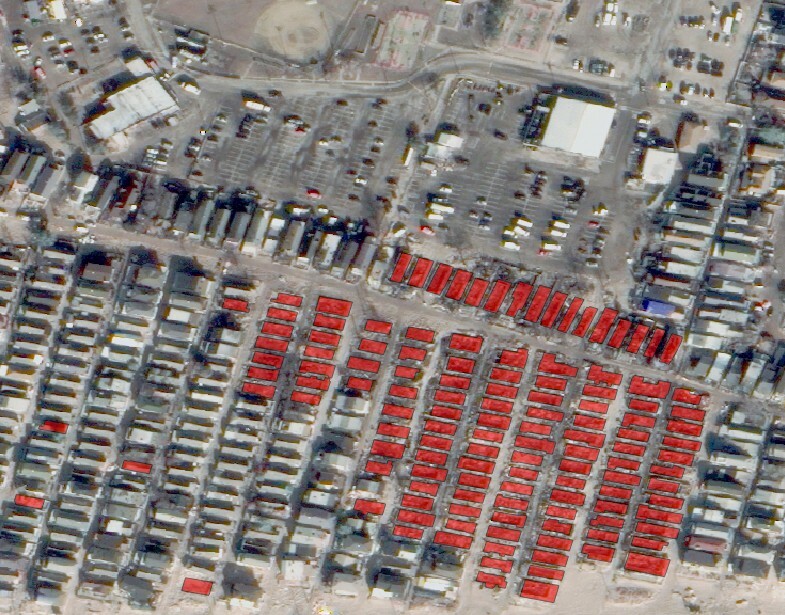 The derived neural net enables us to identify the predicted houses from the target area after the event (Figure 4). We can also use data from another similar area which hasn’t been damaged for CNN learning (if we can’t access the data for the desired territory). We work with predicates of buildings using vectorization (extracting a contour and then converting lines to polygons) (Figure 5). 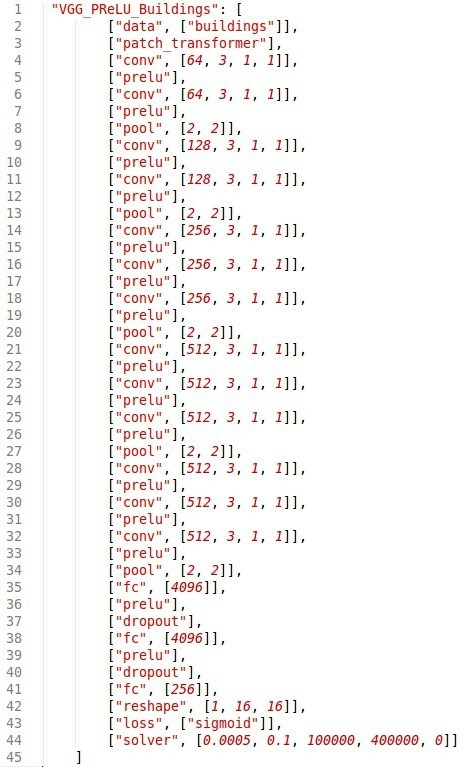 Also, we need to compute the intersection of the obtained predicate vector and the original OSM vector (Figure 6). 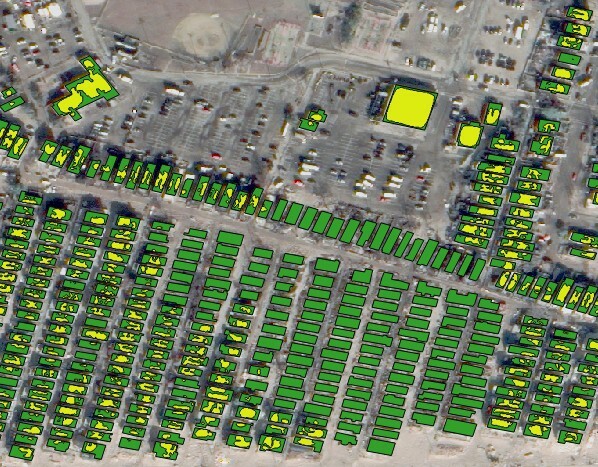 This task can be accomplished by creating a new filter, dividing the square of the predicate buildings by the original OSM vector. Then, we filter the predictive houses by applying a threshold of 10%. 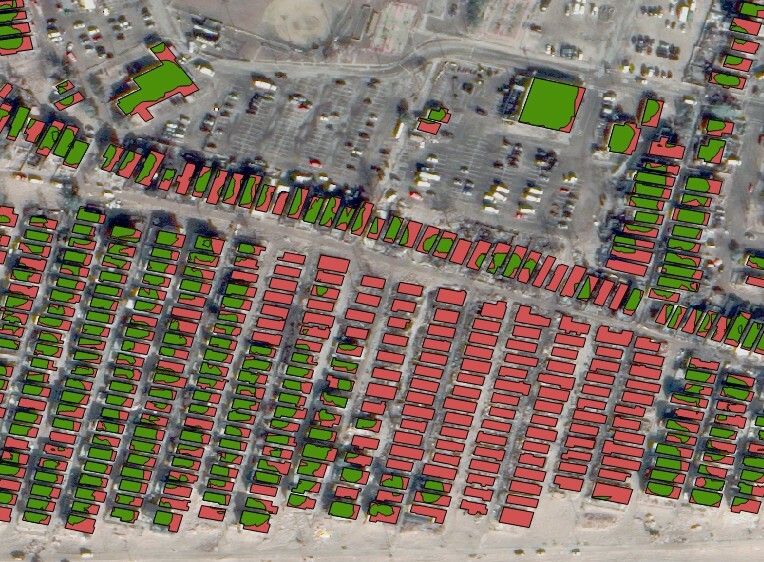 This means that if the area of houses in green (Figure 6) is 10% less than the area in red, the real buildings have been destroyed. 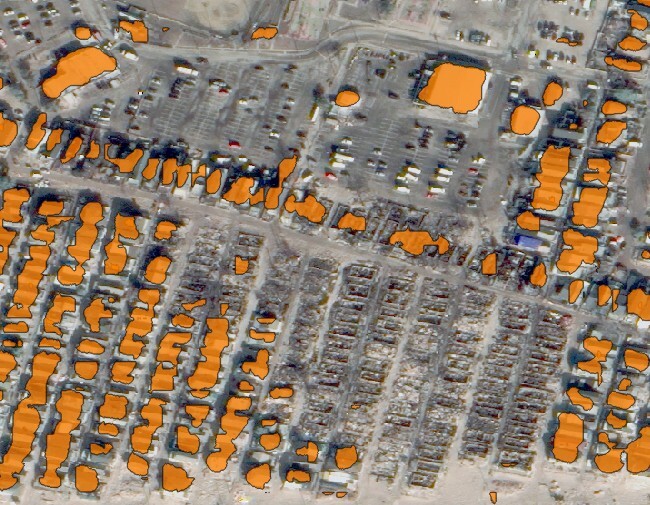 Using the 10%-area threshold we can remove the houses that have been destroyed and get a new map that displays existing buildings (Figure 7). 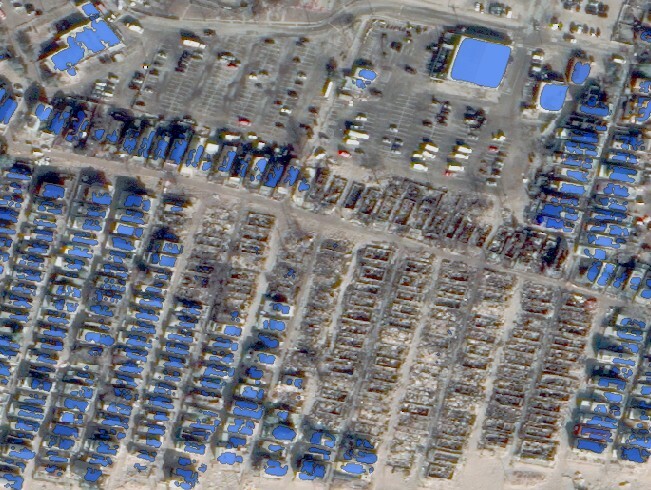 By computing the difference between the pre- and post- disaster masks, we obtain a map of the destroyed buildings (Figure 8). 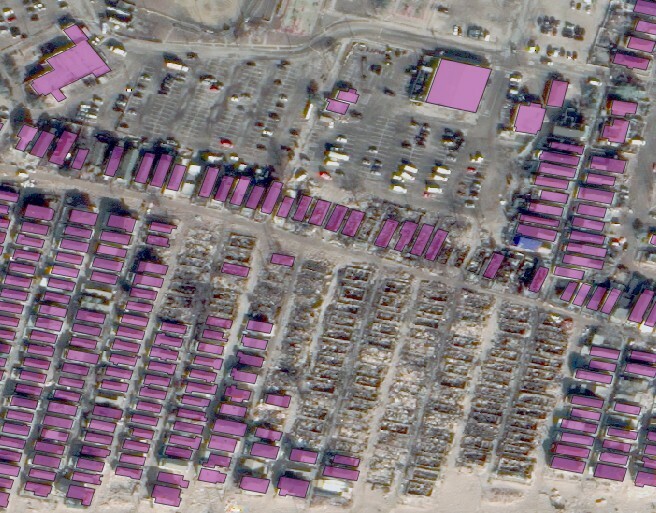 We have to remember that the roofs of the houses are represented as flat structures in 2D-images. This is an important feature that can also be used to filter input images. A local Laplace filter is a great tool for classifying flat and rough surfaces (Figure 9). 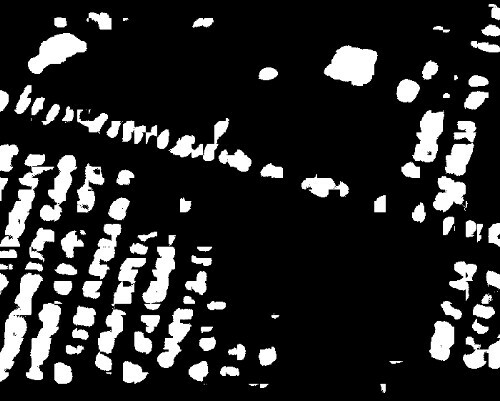 The first image has to be a 4-channel image with the fourth Alpha-channel that describes no-data-value pixels in the input image. The second image (img1) is the same, a 3-channel RGB image. 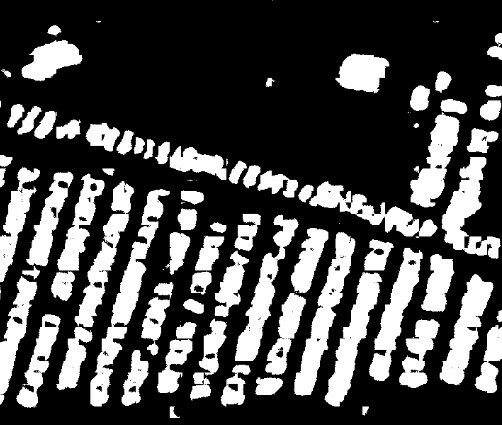 Applying this tool lets you get the map of the flat surface. 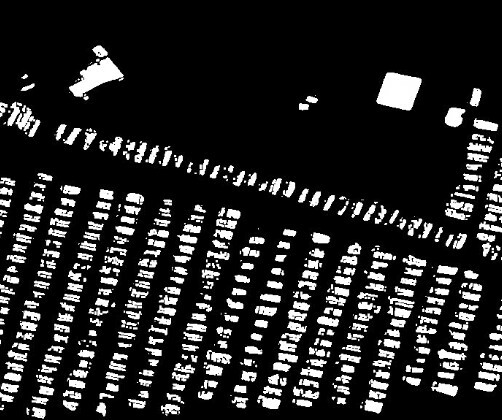 Let’s look at the new mask of the buildings which have flat and rough textures (Figure 10) after combining this filter and extracting the vector map. A robust library of the OpenCV computer vision has a denoising filter that helps remove noise from the flat buildings masks (Figure 11, 12). Next, we apply filters to extract the contours and convert the lines into the polygons. This enables us to get new building recognition results (Figure 13). 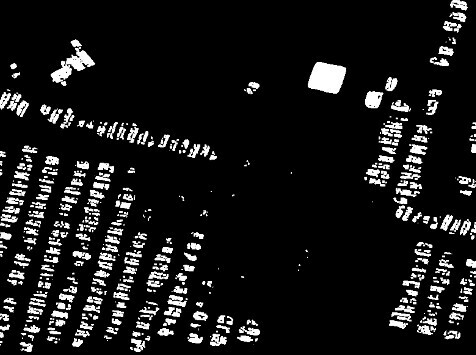 We compute the area of an intersection vector mask obtained from the filter and a ground truth OSM mask and use a 14% threshold to reduce false positives (Figure 14). As a result, we can see a very impressive new mask that describes houses that have survived the hurricane (Figure 15) and a vector of the ruined buildings (Figure 16). 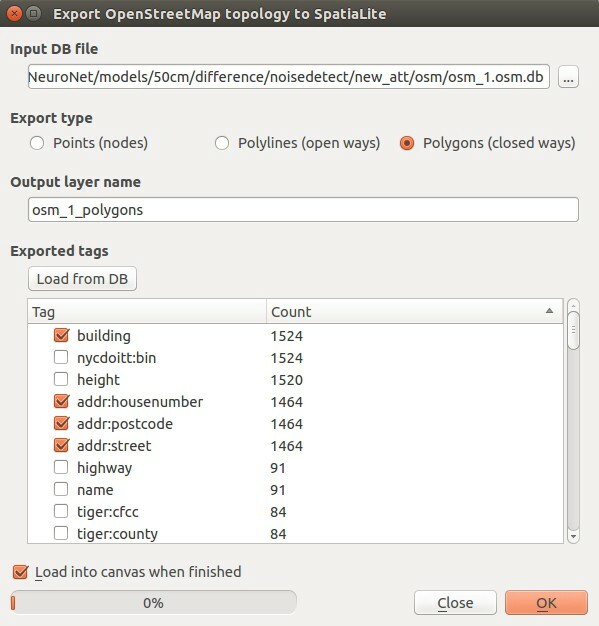 In QGis use Vector / OpenStreetMap / Download the data and select the images with the desired information. Then in QGis use Vector / OpenStreetMap / Import a topology from XML and generate a DataBase from the area of interest. 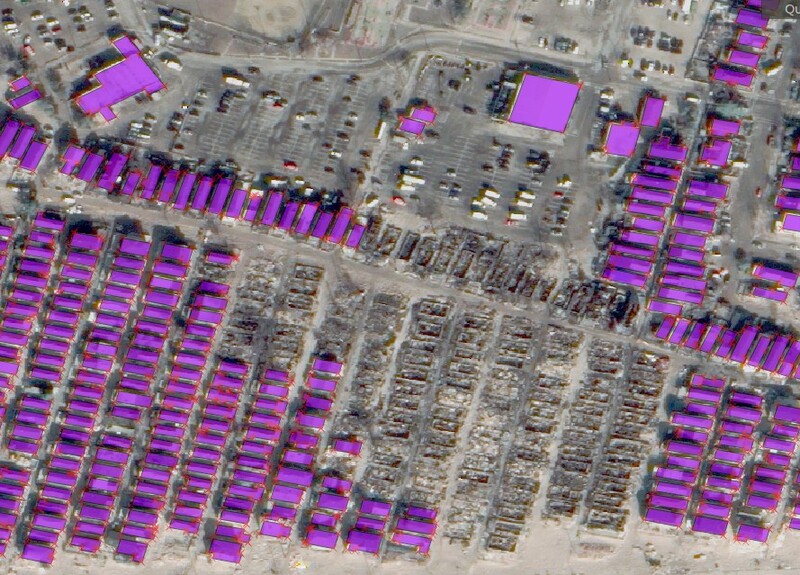 As a result, we can get a full list, with addresses, of the destroyed buildings (Figure 19). 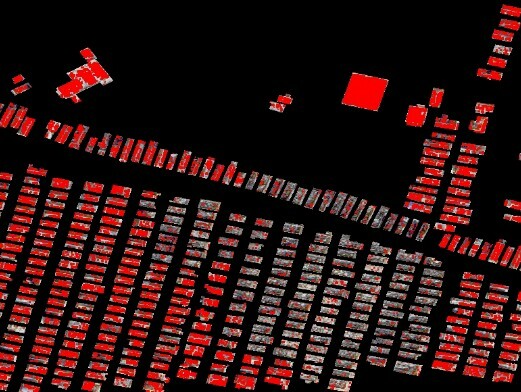 If we compare these two different approaches to building recognition, we notice that the CNN-based method has 78% accuracy in detecting destroyed houses, whereas the Laplace filter reaches 96.3% accuracy in recognizing destroyed buildings. 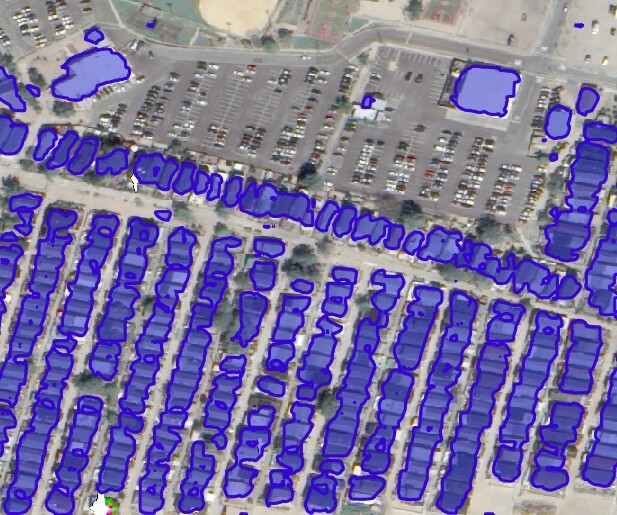 As for the recognition of existing buildings, the CNN approach has a 93% accuracy, but the second method has a 97.9 % detection accuracy. So, we can conclude that the flat surface recognition approach is more efficient than the CNN-based method. 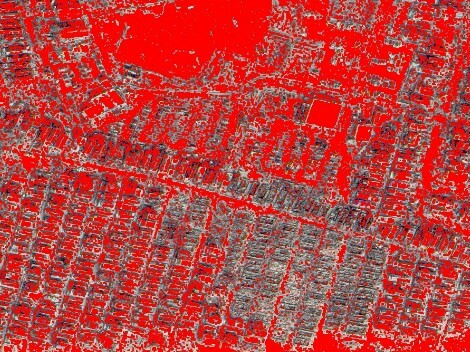 The demonstrated method can immediately be very useful and let people compute the extent of damage in a disaster area, including the number of houses destroyed and their locations. This would significantly help while estimating the extent of the damage and provide more precise measurements than currently exist. For more information about EOS Data Analytics follow us on social networks: Facebook, Twitter, Instagram, Linkedin.